Give your pet a reason to smile! February is Pet Dental Awareness Month and is the perfect opportunity to discuss the steps to prevent dental disease in your pet! Dental disease can lead to health problems for your pet like heart disease, kidney/liver issues and pain/discomfort. Working with your veterinary team, you can keep your pet healthy longer by being proactive about dental care. Some of you may be asking, “How am I supposed to brush my pet’s teeth?” Thankfully in today’s market, there are many different styles of toothbrushes specifically for pets. Some look just like your toothbrush and some are tiny and fit on your finger. The goal is to disturb food bits lodged in between the teeth. You do not need to brush for as long as a human does or as often. It is very important to use toothpaste meant for pets. Human toothpaste is hazardous for pets and should be avoided. 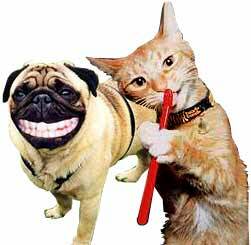 Be sure to use a reward system for your pet as you introduce them to brushing. This will be a new experience for them and somewhat confusing too so take your time, use a calm demeanor and take a break if your pet is getting fussy! If brushing your pet’s teeth is just not possible do not worry, there are other options you can take advantage of to prevent dental disease in your pet! Chew sticks that promote dental health is another way to care for your pet’s teeth. The veterinary brand of chews called CET Chews are a wonderful way to keep your pet occupied and is essentially brushing their teeth while chewing! These are easy to digest chews that have an enzyme coating to prevent the buildup of tartar on teeth. Other chews can also be helpful but always exercise caution when offering something edible to your pet, never leave them unattended while they are chewing and try to avoid chews with added colors and flavors. Using an oral rinse or spray is another method of preventing dental disease. This involves adding an odor/colorless product to the drinking water or is sprayed directly onto the teeth. These help decrease the buildup of tartar over time but are not the best at removing existing tartar. The best way to keep your pet’s pearly whites fresh and clean is to visit your Veterinarian on an annual basis! Your Veterinarian is highly trained to detect dental disease and can provide more clarity on if your pet should have a professional dental cleaning and if there are any concerns about your pet’s teeth like broken teeth, growths on gums etc. that you may be unaware of. It’s also a good idea for your pet to have an oral exam performed annually to ensure optimum health! We all love getting close and cuddly with our pets but bad breath and dental disease can be an unpleasant reality for many pets! Keep their teeth and gums healthy and you won’t be able to get enough of their loving! February 1,2017 through February 28.2017, House Vets for House Pets and our sister location Rover the Rhine, are offering 20% off of your pets dental services. This only applies to dental appointments scheduled 2/1/2017 through 2/28/2017.